The young crew of Morning Light has grown accustomed to the presence of cameras recording their ocean training sessions for a documentary. Paul Crowder, one of the directors of "Morning Light," Disney's documentary film about the youngest crew ever to attempt the 2,225-mile Transpacific Yacht Race, said he's still unsure about the finished product, set for national theater release in 2008. He estimates the first third of the film will be devoted to preparing for the race, and is likely to include footage from the crew members' respective hometowns around the country. "How we structure it will really come in the edit bay," he said. "The hard part is making the dialogue work." 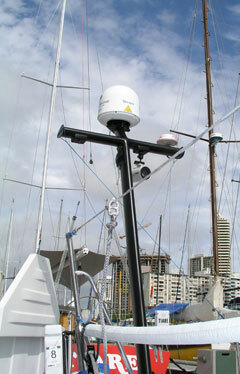 Technical sailing terms are often lost on the general public, and everyone wants the movie to be accessible. "The idea is to keep the story engaging." To incorporate a strong human element, the filmmakers asked the sailing crew to keep written journals of the experience for use in the film. "We want to stay away from a 'talking heads' documentary as much as possible," said Crowder, who's also completed a film about the Who. The 15 young sailors -- ages 18 to 23 -- return to their homes for two weeks out of every month. They spend the other two weeks in Honolulu training, eating and sleeping as a group. Cameras have become such a constant presence that the crew doesn't seem to notice them anymore. Even when Crowder filmed a recent ocean training session from Diamond Head, he made sure to have another shooter to maneuver among the sailors -- between frequent pauses to wipe salt spray from his lens. To accommodate filming, devices have been rigged on deck to keep the cameras steady and close to their subjects. The goal of those omnipresent portals is to capture a little of the mysterious high-tech world of sailing, and a lot of some extraordinary young men and women coming into their own. "They're a great bunch of kids," Crowder added. "They're coming together really nicely." Even so, he knows the event itself will not be easy. "Honestly, I think them finishing the race would be a fantastic accomplishment." A camera in a waterproof housing is mounted on the Morning Light's stern, offering a sweeping view of onboard activity. 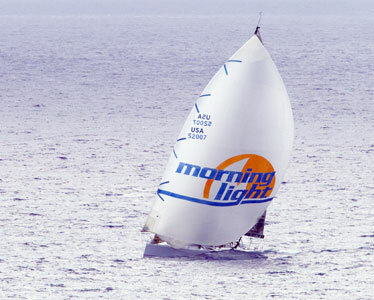 In conditions choppy enough to make any sailing amateur beg for shore, the nubile crew of Morning Light breezed around the never-level deck last week as though born for the job. Then again, most of them probably were. "Let's get that jib up right away!" hollered Olympic sailing gold medalist Robbie Haines, who has become the on-the-water trainer/manager and default father for the crew. A spinnaker billowed, quickening the boat's pace over the ocean before the "kite" was pulled down and bagged, and the boat dramatically shifted direction. Moments of frenzied activity and shouting were interspersed with spells of leisurely conversation. Haines mentioned an opportunity to sail boats back to their home ports in California from Hawaii after the Transpacific Yacht Race. Several students eagerly volunteered, unconcerned about whether the job would pay anything. 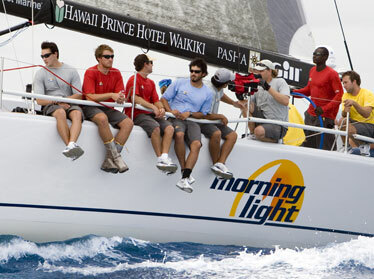 The crew of Morning Light is back in Honolulu for another two weeks of intense training under the guidance of sailing's brightest stars. With a Disney film crew following their every move for a 2008 documentary film, they are preparing for the most challenging event of their lives: the 2,225-nautical mile Transpacific Yacht Race from Los Angeles to Honolulu in July. The only difference is that instructors like Haines and legendary navigator Stan Honey, who has guided sailboats in 15 Transpac crossings, will not be with them during the race. The students, ages 18 to 23, will have to fend for themselves day and night for about a week in the middle of the Pacific. Every moment of training has been a learning opportunity for the young sailors, selected from hundreds of applicants from around the country. "I pressed the reset button in terms of sailing knowledge," 22-year-old Charlie Enright of Rhode Island said during a lull in activity during the ocean training session. "It's unbelievable; everything is at your fingertips." The students aren't the only ones excited about it. Honey said he was thrilled to finally meet Nainoa Thompson after reading about Polynesian voyaging for years. "It was really fun to ask Nainoa questions that I'd been wondering about since college," said Honey. The Morning Light sailed in choppy waters off Diamond Head last week. On this particular morning last week, the 15 young sailors trained at a 24-Hour Fitness center with Ironman triathlete Janell Petalver, then went directly to the classroom for instruction on winches -- those tricky devices that sailors hunch over and crank rapidly with their hands. Because Transpac veteran Roy Disney is producing the documentary, the best instructors have made themselves available to the crew. The arrangement might be compared to attending basketball camp and having Shaquille O'Neal come around to offer a few tips, or preparing to direct a student film and expecting Martin Scorsese and Clint Eastwood to drop by for some one-on-one time. Bob Wylie, the man who helped design the versatile Harken winch, taught the students in the classroom and continued his instruction on the boat. The Yanmar diesel engine was the topic scheduled for the following day, and engine expert/designer Ed Auck also was on board. So was Tom Pollack, who helped design the $1.5 million TP 52 racing boat with two masts (in case one breaks) and 30 bags of sails. Coming later that week was Mike Sanderson, World Sailor of the Year. The reason for so much intense tutelage? "These kids are going to be out on the ocean by themselves, and they need to be competent in fixing mechanical problems that come up," said Haines. Beneath carbon sails that rise more than 70 feet in the air, Steve Manson, a 22-year-old from Maryland, took the wheel under Haines' close supervision. Fuzz Foster of North Sails provided detailed information about the abundant selection of spinnakers they sampled. Crew members are rotating through different positions to find out where they feel most comfortable. While everyone will be trained to do just about anything, a few will gravitate toward specialties. Piet van Os, a 22-year-old California Maritime Academy student from La Jolla, Calif., is vying for one of two spots as the vessel's navigator. But there's another undercurrent running through the group: A crew of 11 will be selected to race, leaving four elite sailors to assist from shore. "Everybody's worried about not making it," van Os said a couple of months ago, though he added that the spirit of competition has not affected camaraderie. Some, like van Os, have put their college education on hold for a year to participate in this project. And while the competitors receive room, board and "a gorgeous boat to race," he said, they don't get paid. But there's no doubt in his mind that "this is definitely worth it."